Repeat tests on animals for drugs which have already been approved by other countries will not be necessary from now on in India, the Centre has said with the move being hailed by animal rights bodies. The Union Health Ministry has amended Schedule Y of the Drugs and Cosmetics Rules, 1945, which states that animals will be spared the cruel tests for new drug registrations where complete data from similar toxicity experiments already exists for drugs approved abroad. “Where the data on animal toxicity… Has been submitted and the same has been considered by the regulatory authority of the country which had earlier approved the drug, the animal toxicity studies shall not be required to be conducted in India except in cases where there are specific concerns recorded in writing,” said a notification signed by the ministry’s joint secretary, KL Sharma. The amendments follow repeated appeals by People for the Ethical Treatment of Animals (PETA) India and Union minister Maneka Gandhi, a well-known animal rights activist. Explaining the amendment, a senior PETA official said if a particular drug, which is being introduced in India, has been approved in a particular country after tests on animals, then conducting such tests again for the same drug here will not be required. The notification says that no permission will be required to conduct clinical trial intended for academic purposes in respect of approved drug formulation for “any new indication or new route of administration or new dose or new dosage form where the trial is approved by the Ethics Committee and subject to the provisions of sub-rule 5, the data generated is not intended for submission to licensing authority”. According to PETA India Research Associate Dipti Kapoor, “by banning redundant and painful tests on animals, the Indian government will spare the lives of potentially hundreds of thousands of animals in repeat experiments each year”. Humane Society International also hailed the move. PETA said that last year, upon reviewing the requests from PETA and Maneka Gandhi, the Indian Investigational New Drugs Division recommended to the Drug Technical Advisory Board (DTAB) that animals be spared cruel tests for new drug registrations when complete data from earlier toxicity experiments already exist for drugs approved abroad. PETA supporter and X-Files star Gillian Anderson, who was in India for a movie, had also written to the Union Health Minister requesting a ban on repeat experiments on animals in toxicity tests by amending the Drugs and Cosmetics Rules, 1945, PETA said. “We welcome this move by the health ministry. 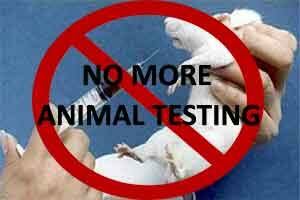 The new amendment will not only save thousands of animals every year from being subjected to redundant animal testing, it also marks the beginning of a potential new era of sophisticated animal testing alternatives in India. “We look forward to continuing our association with the ministry to ensure that use of validated alternatives is encouraged as the Drug Technical Advisory Board has recommended,” said Gauri Maulekhi, Humane Society International, India consultant.